Celebrating this Holiday Season will be a challenge for many families and children impacted by Hurricane Sandy, but New York Giants starting Defensve Tackle, Chris Canty hopes to lend a hand in helping those families this year. 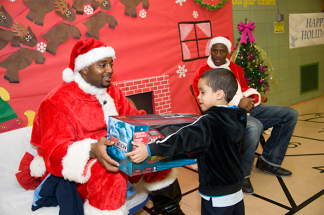 Starting on December 14th, 2012 The Chris Canty Foundation will be donating toys to over 500 youth throughout the New York TriState area. On December 17th, 2012 The Chris Canty Foundation will be donating 100 toys to youth from Long Island, NY impacted by Hurricane Sandy. The Holiday Giveaway will take place from from 1:00 p.m. to 4:00 p.m. at Prime Diagnostic Institute located at 4250 Veterans Memorial Highway, Suite 1050 West, Holbrook, NY 11741. Prime Diagnostic Imaging/Neurorays of New Jersey, US Veterans Motorcycle Club NY State, Cafe Amici, Jacob Light Foundation, the New York Nationals, and JVC BROADCASTING CO will be partnering with The Chris Canty Foundation to honor students of Harding Avenue Elementary of Lindenhurst, NY. The school serves roughly 235 children. The goal of Harding Avenue Elementary School is to provide students with an environment that meets their intellectual, emotional, and social needs. The school offers students an interdisciplinary curriculum that builds essential skills in language arts, mathematics, science, and social studies. Students participate in specialized instruction on a weekly basis in such subjects as physical education,library and media, art, general music, and computer technology. Education. Fitness. Service.2011 Christmas Giveaway Program (Bronx,NY Elem. School) While the elementary school exposes students to methods that encourage academic excellence, it is still important to engage them in this philanthropic effort. Canty recalls why this initative is one that is so important, “This is more about letting the parents and children know that we care in this time of need. While we feel the students should be rewarded for their academic performance, we also want them to recognize that efforts like these are necessary because so many children we be left out during the holidays this year because due to the impact of Hurricane Sandy,” he shared.For more information on this Christmas Giveaway Program or to learn more about how you can support the Foundation’s efforts, please contact Joseph Canty, President/Chairman, via email at mailto:info@chriscantyfoundation.org or you may call 704-845-4601. The Chris Canty Foundation is dedicated to enhancing the total development of youth in our communities. Our goal is to utilize the platform of sports to affect positive change in the lives of children through mentoring, educational programs, and physical activities thus promoting health and well being. We seek to inspire our youth to be in service to our communities and our communities to be in service to our youth by providing support to these initiatives. students in applying the skills of diagnostic ultrasound is dependent on a vigorous process of hands-on training coupled with structured comprehensive instruction. The program, therefore, is committed to supporting the professional and personal development of each individual seeking this career.